The street is just three minutes’ walk west of Piazza Maggiore in the heart of the historic centre of Bologna. Originally named Vicolo Tintinaga, it was renamed Via Mario Finzi in honour of a hero of the resistance, Mario Finzi (1913-1945), who is named on the Holocaust memorial on the façade of the synagogue. Mario Finzi was a Jewish magistrate and judge and a talented musician who was born in Bologna in 1913, the son of teachers. Finzi was a talented musician and pianist, and was already a magistrate and a judge at the age of 24. He began his legal career in Milan in 1938, but he was soon hampered by the Fascist racist laws promulgated that year. He then moved to Paris, where he dedicated himself totally to a life as a musician, working as a pianist on a contract with French Radio. His name is kept alive in Bologna today on the pedestrianised street where Bologna’s main synagogue stands. Two of us had lunch in the historic heart of old Bologna yesterday with Peter Bolot from New Zealand and his wife, the Israeli writer Shifra Horn, from Jerusalem. Later in the day, the Irish Jewish Museum was in contact with me, trying to source images from this blog. 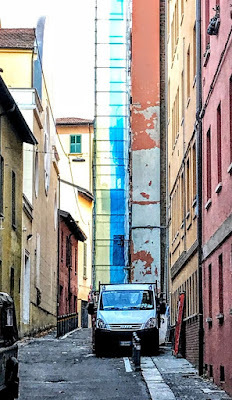 They were unusual coincidences on a day I was researching the story of Bologna’s ancient Jewish community. Last week, archaeologists and the Jewish community here announced that the site of Bologna’s mediaeval Jewish cemetery has been rediscovered, four and a half centuries after its desecration and destruction following the Papal expulsion of Jews in 1569. In all, 408 graves have been found in the largest-known mediaeval Jewish cemetery in Italy. Although the discoveries were made in 2012-2014, the discovery was only announced on Tuesday last week at a news conference by the Mayor of Bologna, Virginio Merola, Bologna’s Chief Rabbi, the president of Bologna’s Jewish community and other officials. The cemetery was discovered during the excavation of a site earmarked for a new housing project. The newly-found graves include women, men and children. Some had been buried with ornaments made of gold, silver, bronze, hard stones and amber, the superintendent said. 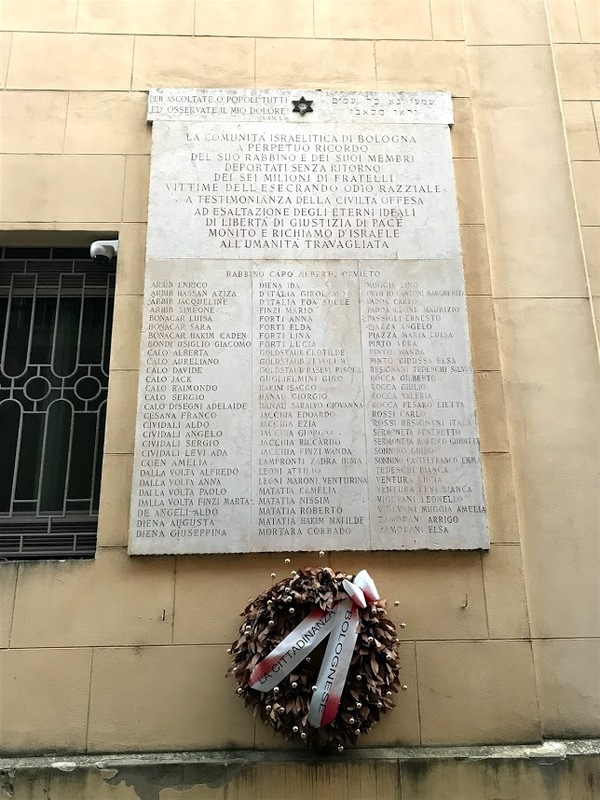 The area, which is near Via Orfeo, was used as a Jewish cemetery from the 1390s, but it was destroyed in 1569 after Pope Pius V banished Jews from everywhere in the papal territories except Rome and Ancona. The 408 graves uncovered recently were perfectly aligned in parallel rows in an east-west direction. No trace of tombstones been found, and 150 graves showed clear signs of deliberate desecration. However, four ornate Jewish gravestones beautiful sculpted Renaissance lettering and on display in Bologna’s Civic Mediaeval Museum are believed to have come from this cemetery. Rabbi Alberto Sermoneta has said the recovered remains needed to be given a dignified burial. The first Jewish presence in Bologna is recorded by Saint Ambrose of Milan, when he came to Bologna in the late fourth century to move the bodies of two Christian proto-martyrs, Saint Vitalis and Saint Agricola, to the Basilica of Saint Stephen. They were exhumed from the Jewish cemetery, or the so-called Campus Judeorum. Later, local legends say, a hypothetical Jaqob Calderisi from Castel Tedaldo lived in in a house between what is now via Caldarese and via Castel Tialto. In the second half of the 1300s, a large number of Jewish immigrants arrived in Bologna, and by the end of the 14th century the city had bustling Jewish population. As Bologna experienced growth and development, many of specialised Jewish craftsmen worked on important city monuments, including the Loggia dei Mercanti, the Basilica of Saint Petronius, and the churches of Saint Stephen, Saint Francis and Saint John, built in the Gothic style. These Jews lived in peace in the city for two centuries. They settled mainly in the area located between the ancient Roman settlement, which goes from the Two Towers up to Piazza Malpighi, and the ancient Lombard camp which also starts at the Two Towers and runs in a semicircle towards the churches of Saint John on the Mount, Saint Stephen, Saint Vitalis and Saint Donatus. The area was eventually renamed via de’ Giudei or Jews’ Street. 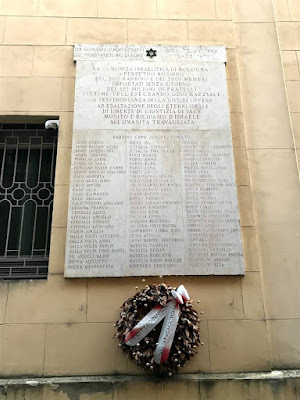 The first immigrant, Gaio Finzi, Judeus de Roma, practiced as a strazzarolo” or a ‘rag-man.’ Many Jews in Bologna formed their own guild called Giudei, ‘The Jews’, but officially known as the Corporazione di Drappieri-Strazzaroli-Pegolotti-Vaganti e Giudei, the Guild of the Drapers, Ragmen, Upholsterers, Wanderers and Jews. Its headquarters were in the Palazzo degli Strazzaroli, known today as the Case Malaguti. The guild contributed to the economic and cultural development of Bologna, guild members built three synagogues and laid out a cemetery, and eight more synagogues were built in the nearby villages. Two of the city synagogues were in Via San Vitale and the third was on via Santo Stefano. One of the two in Via San Vitale was called La Grande or the Great Synagogue. The Jewish community had a very close relationship with the University of Bologna. Jewish students received degrees in medicine and Jewish professors taught there. The university adopted texts written by Jews, including Maimonides, and Jewish scholars translated medical texts from Arabic into Hebrew and Latin, and from Latin into Hebrew and Arabic. Bologna had respected Talmudic academies, important Torah teachers, and was the source of many printed Jewish religious books. The world’s first edition of the Book of Psalms printed in incunabulum, as well as ritual prayer book, and a collection of 16th century books are preserved in the library at the University of Bologna. Jacov Mantino was called to teach medicine by Pope Clement VII, and another professor, who chose to remain anonymous because he was a Jew, was called to teach Hebrew literature. Famous rabbis, such as Obadia Sforno, Azarià de Rossi, and Samuele Archivolti settled in Bologna and contributed to developing local Jewish culture. This ‘Golden Age’ came to an end at the Counter-Reformation, when the first Italian ‘Grand Inquisitor’ became Pope in 1555. The Jews were ordered to be locked up in what was called the Serraglio (‘Enclosure’) or Chiuso degli Ebrei (Pen for the Jews), later known as the ghetto. It took about 11 years from the publication of the Papal bull for all the Jews of Bologna to move into the ‘Jewish cage.’ The creation of the ghetto met with resistance, and many other families were forced to relocate. Many Christians, for example, were reluctant to abandon their homes in the city, were forced to rent them to Jews. Two large streets ran through the ghetto – Strada San Donato, today’s Via Zamboni, and Via Cavaliera, today’s Via Oberdan – and four large gates served as entrance and exit points. The entire perimeter of the ghetto has been the subject of recent conservation work. Free movement to and from the ‘enclosure’ was forbidden in 1567, and by 1569 only one synagogue remained in Bologna’s ghetto, in Via dell’Inferno, at what is now No 16. That year, the Jews were expelled from the city. When they were allowed back in again by Pope Sixtus V in 1586, they did not go back to the ghetto, and in 1597 Pope Clement VIII expelled them for good with the following decree: De Iudeis ex universo Statu Ecclesiastico expellendis, Roma, Avinione et Ancona exceptis (‘On the Jews, who must be expelled from the entire Papal State, with the exception of the cities of Rome, Avignon and Ancona’). The decree was nailed to the doors of the Basilicas of Saint Peter and of Saint John Lateran in Rome on 13 March 1593. Jews returned to Bologna two centuries later, following the French Revolution. They stayed on after Napoleon’s defeat, when city fell under control of the Papal States. In 1858, a housemaid working for a Jewish family claimed she had secretly baptized a six-year-old Jewish boy named Edgardo Mortara. The Inquisitor of the Holy Office then sent his armed guards to the family home to remove the child and give him a Catholic upbringing. The Mortara family incident moved the people of Bologna, and changed public opinion, significantly damaging the Pope’s power in Bologna. With the Unification of Italy, Jews acquired full human rights, and migrated to Bologna from other parts of Italy. From 1830 to 1930, the city’s population rose from about 100,000 to about 400,000 and its Jewish population at the same time rose from about 100 to about 900. A new synagogue, built in 1874-1877 on a plan by Guido Lisi, was dedicated on the evening before vigil of Shavu’ot in 1877. As the Jewish community continued to grow, the synagogue became too small and Attilio Muggia was commissioned to design a new synagogue. This building was designed in the Art-Nouveau style with a pavilion vaulted roof, and was dedicated in 1928. The building stood on Vicolo Tintinaga, now known as Via Mario Finzi. It was destroyed 15 years later in an air raid on the city in 1943. After World War II, the synagogue was rebuilt by Guido Muggia and dedicated in 1953. For the first time, the façade – albeit on a side street – was visible to the public. But for security reasons, the entrance to the synagogue is through the Community Centre at the back. 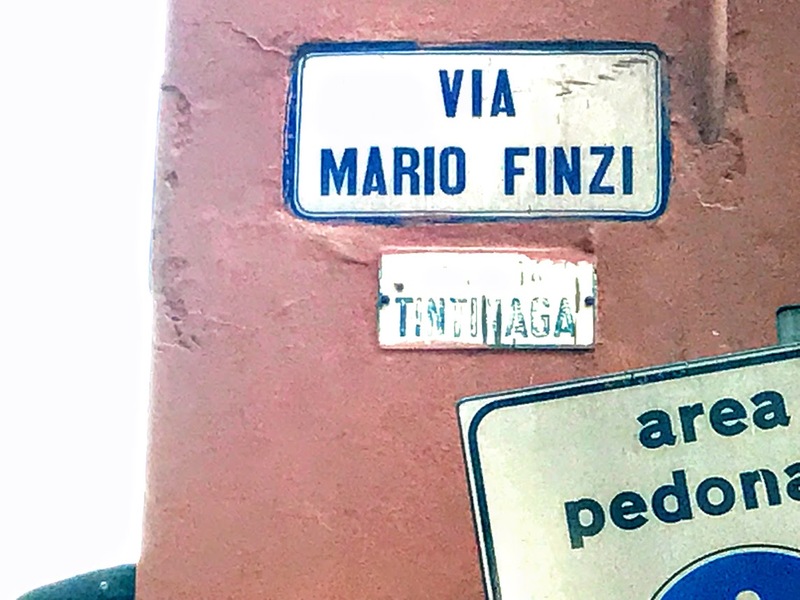 The street is named after Mario Finzi (1913-1945), a Jewish magistrate and judge and a hero of the resistance in Bologna. But it is worth telling his story in another posting later today.